Notes for Life offers an in-depth discussion of current topics relating to the sanctity of life: abortion, end-of-life, marriage and family relationships, fertility, bioethical questions in health care and more in a quarterly newsletter format. Sign-up to receive Notes for Life by email through the LCMS e-news system. 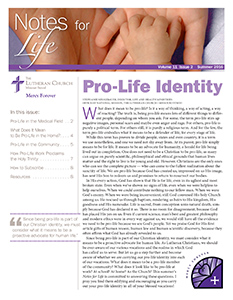 Subscribe to the Notes for Life e-news in your myLCMS profile. Also visit the LCMS Life Library for many useful sanctity of life resources.